A powerful true tale of war, romance, and one of history's most desperate gambles. Julius Caesar was nothing if not bold. When, in the wake of his defeat of Pompey at Pharsalus his victorious legions refused to march another step under his command, he pursued his fleeing rival into Egypt with an impossibly small force of Gallic and German cavalry, raw Italian recruits, and nine hundred Spanish prisoners of war-tough veterans of Pompey's Sixth Legion. 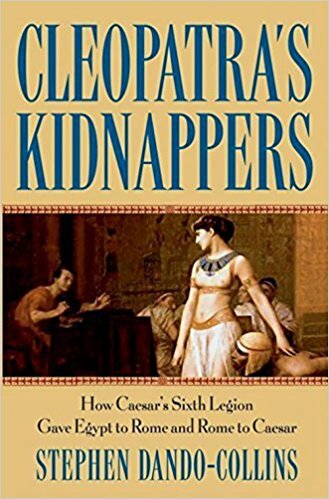 Cleopatra's Kidnappers tells the epic true saga of Caesar's adventures in Egypt through the eyes of these captured, but never defeated, legionaries. In this third volume in his definitive history of the Roman legions, Stephen Dando-Collins reveals how this tiny band of fierce warriors led Caesar's little army to great victories against impossible odds. Bristling with action and packed with insights and newly revealed facts, this eye-opening account introduces you to the extraordinary men who made possible Caesar's famous boast, ""I came, I saw, I conquered."" AVAILABLE IN ENGLISH AND POLISH EDITIONS AND AUDIOBOOK.